Since I last published thoughts on how QR Codes could be used for learning in a short audioBoo (click the link or scan the QR Code on the right), there has continued to be a growing and significant buzz about QR Codes on Twitter and in the blogosphere. A narrative is developing as ideas, experiences and best practices are shared and discussed. The ball got rolling at TeachMeetX where Julian S. Wood delivered a thoroughly engaging presentation on storytelling and QR Codes. I couldn’t be there in person but was fortunate to catch most of what Julian had to say via UStream. What struck me during the presentation was not the quality of the tech but the pedagogical principles that underpinned the activities putting the technology where it belongs: at the heart of making the learning happen but not directing it. Hopefully, the video of the presentation will be available soon and everyone can see it. One of the tools that Julian used was Delivr which I have written about here and will mention again later in this post. This struck me as immediately pertinent as there is a huge drive on assessment for learning and the marking of work in my school at the moment, what with Ofsted just around the corner. More importantly it is one of my many beliefs, in relation to education, that assessment can be a driving force in improving a students progress and attainment. This may be one way that I myself experiment with QR Codes and/or stickybits. Dughall finished by sharing a few other useful links including a collaborative guide produced by Tom Barrett et al. about using QR Codes in the classroom. It is part of his excellent Interesting Ways series and so far there are 14 different ideas about how to use QR Codes. Also mentioned by Dughall and tweeted out the same day was a post by the ever innovative David Mitchell – blogging about his use of QR Codes with his Year 6 class. He explained and demonstrated through photos how they had been used. Essentially his students had drafted a piece of work in their books. 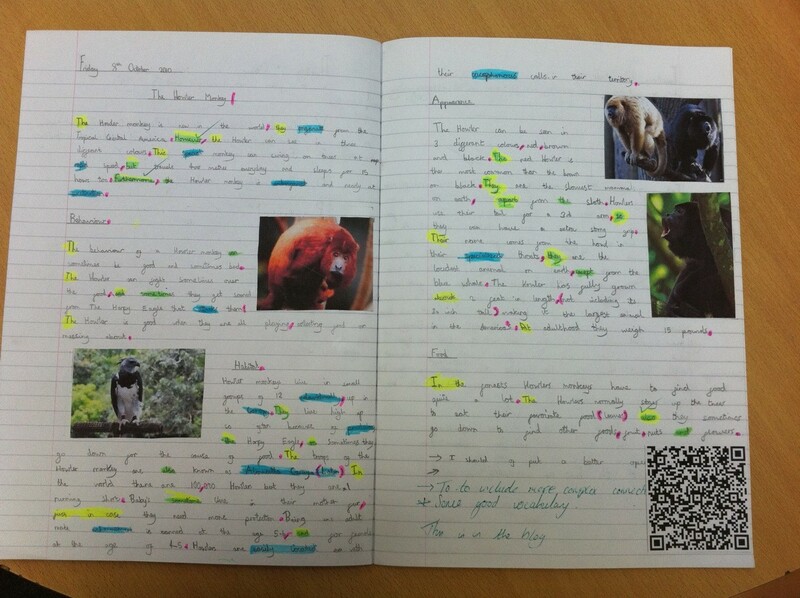 They then wrote up their work on their class blog and generated a QR Code from their blog post’s URL. This was then stuck into their books. Instantly the gap between analog and digital work was bridged (or as David put it: “A Literacy book suddenly becomes an interactive book of weaved magic!”). By allowing anyone to scan the code and see the final draft of the work while looking at the first draft it changes the engagement and interaction with the students work bringing the student, teacher, parent closer to creative and developmental process. A clever and highly effective use of QR Codes I think. Below is an example of one of the images from David’s post – click to zoom and then scan the code – it really works! As the discussion continued on Twitter over the next couple of days more and more resources and posts related to QR Codes began to come to light, demonstrating the fact that the technology is not that new and that educators have been toying with it for a while now. One such post that was tweeted was from Ollie Bray who had written about QR Codes (back in 2008) in a post titled: iPhone in Education – Using QR Codes in the Classroom. In his post he details how QR Codes work with some clear broken down screen shots. Towards the end of the post Ollie makes a couple of suggestions about potential uses but overall it stands as a good post for QR Code novices to help them understand the basic principles. This was followed by a link to a PDF document (hosted by the EDUCASE Learning Initiative) titled: 7 Things You Should Know About QR Codes (written in 2009). The document is well structured and concise (2 pages), offering answers to basic questions like: “What is it?”, “How does it work?”; to more complex ones like: “What are the implications for teaching and learning?” This is a good starting point for QR Code novices. Download here. There were a few more posts that were dragged up from the archives but I will not comment on them all here. A Twitter search for QR Codes should provide some useful results. The final post I wish to discuss is fresh and new and was only published this week, on October 26th, over at the blog of David Hopkins – Don’t Waste Your Time. Titled: QR Codes: It’s not all about the phone, you know. David offers up three potential applications that could be used to scan QR Codes from your desktop computer. This was interesting and I am going to download and play with the Desktop QR Code Reader myself. Reading David’s most recent post though led me back to his many other posts about QR Codes, some of which I had read through a few weeks ago when I had just begun to look at QR Codes myself. I felt that I would re-mention the post: QR Codes in the Classroom. The explanation and suggested uses are very good but even better than the written word is the video David has included of QR Codes in action. Scroll through the post, find the video and give it a watch. If you are still unsure about the potential of QR Codes, you won’t be after you have watched the video. 1. Creating a class project based around similar principles to those presented by David Mitchell. I really felt the simplicity of linking physical writing with online content was an interesting notion that warrants further exploration. I need to give it more consideration but I see excellent opportunities here to connect the creative/tactile freedom of my classroom with some of the tools that I already use with my classes online. One idea that came to mind was to get my students to collate a variety of useful material on a Lino It canvas, generate a QR Code for their wall. Then back in the classroom preparing for their controlled assessment they could scan the QR Code (now stuck in their books) to access that information. Once I have planned the activity better and have the results I will certainly blog and share it. 2. Educating students, parents and fellow teachers on what QR Codes are and how they can be of use inside and outside of the classroom. I think there is an opportunity to share simple info like revision tips, short helpful videos and other similar materials. In principal this is straight forward as I have seen several good examples of QR Codes being used. One of the keys is to include info on how to scan the codes and where to get an app to do it. With this in mind I found this clip from CSI on YouTube. It provides a fairly clear and engaging explanation of what a QR Code is. I have shared it via Delivr which displays it on a dedicated page making it easy for it to be reshared. What’s more, as I mentioned in my blog post about Delivr when viewed on a mobile phone the page is optimised for mobile screens. The success of sharing info in this way will be more difficult to judge than within the controls of a classroom based activity. This is why I will be using Delivr to generate the codes. Signing up for an account allows you to track the QR Codes you create. I will be able to get instant raw data on whether the codes are being scanned. Again I will blog and share the results. Before I close this post I will share one more useful link. There are several pages on the web that help you find the right QR Code reader for your phone but I felt that this one from PercentMobile was the most effective. Simply select the manufacturer and handset model that you own and it then provides you with a link to an app that will work with your device. Get out there and get scanning. If you have anything to add to the QR Code narrative, perhaps you have experimented with them in your classroom; or you have a useful resource to share; or you have read a good blog post then please share it via Twitter using the hash tag #qrcode or reply to this post. This is so exciting – I’m really intrigued with how QR codes can shorten the mundane tasks in teaching. What’s the best app for the iPhone that I can use to start experimenting? A great post with many ideas to use QR codes for teaching and learning. Thanks for posting James. You’re welcome. I’m glad you found it useful! Yes, I have scanned it on my Android phone. If by “Not good”, you are referring to the size of the text, it is simply that the student’s (10 yrs) blog is not optimised for mobile viewing. A simple double tap of the screen will reformat the text to display in a more easier to read fashion. This by no means detracts from the potential of the technology. Rather than simply pointing out a flaw, you could perhaps offer some helpful “student friendly” advice about how to optimise online content for reading on a mobile device. Was viewing it on an iPod and the text wasn’t abnormal in size, but just displaying one word per line. That’s all. With regards potential of the technology, yes, can see a real potential for QR codes in education and development for use in student assessment / feedback. I do think however, that teachers need to recognise that not all pupils would have access to the internet and perhaps a text only based QR code (that doesn’t need internet to access) might benefit better. The QR codes could then be placed around school away from wifi hotspots, but contain important information about that area. So long as a pupil’s iPod has the reader and the camera, it will read the plain text. Sorry to hear that. On my Android browser the text displays correctly but it is quite small. Your suggestion is a very valid one and something that I had considered. I think that it is a technology that is very much in development and will grow up as smart phones become more common place. I too had the formatting issue on my iphone. This can be solved using delivr. 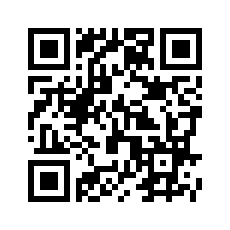 I’ve created a QR code through delivr (for the same link contained in the QR code in the book) that when scanned gives the user the option of going to an optimised page for mobiles (through google) or straight to the page. I don’t think the image will show up in this comment (maybe James could add it to the post?). Thanks, scanned and it works. I’m really enjoying using Delivr to share links myself. It’s a fab service. Top stuff as ever Jimmy. You need to get in touch with Toby Holman who has done some fantastic stuff with QR codes including giant QR codes outside each department area for virtual tours during Open Days. Have personally done stuff with QR codes linked to Moodle quizzes and some orienteering around school. I think QRs will take real hold when we get more portable resources available. DugHalls twitter post on use of stickybits has been followed up by IanAddison. Thanks for the info Gideon. Will check out what both Toby and Ian have been doing. I would love to know how you used QR Codes during orientation. I really want to explore how QR Codes can be used on a larger scale beyond the classroom. Going to have a crack at using QR codes in PE. Have linked some QR codes to softball instructional vids and will get kids to do some reciprocol teaching using the video to set up drills and explain techniques. That sounds like an excellent idea – please share how you get on. Would be great to hear what the students think about the technology. A great read, thanks James. I too am exploring the use of QR codes. My first venture was the addition of a code on a Maths worksheet that linked to a youtube video that gave addition explanations on similar problems. The second venture is the use of QR codes for home work. I have set up a QR code for each class I have and have them linked to a short URL in delivr. The short URL is in turn linked to the latest home work that I have posted on showmyhomework.co.uk (which is a unique address for each homework). Whenever I create a new home work all I need to do is to update the address assigned to the short URL (meaning that the QR code remains unchanged). I’m planning on printing out the codes so that the pupils can stick them into their planners. This sounds excellent and obviously through Delivr they can access the material via the short URL or the QR Code ensuring that none of the students are left out. I had a Skype meeting with David Harper (CEO of Delivr) last week and we discussed the value of being able to change the information connected with a QR Code. I think this is something that needs to be more widely shared as once understood it makes the process all the more straightforward and valuable for the students. I may follow your lead and try something similar with my classes. Thanks! I think you could be right and will certainly further change the game in how we give out/receive information. I think, having read your superb posting, that I finally ‘get’ what the potential for QR codes is – its taken me a long while. Thanks for the illumination. This is an excellent article because it collates and explains QR codes. However, I am not convinced as to the educational value of these graphic squares. Where I can see the seduction in having a crazy square turn into a web page at the click of a button, I can also see a simple shortened URL would do the job better. For example, if a school hosted it’s own URL shortener, it could create a link for every pupil that had a standardised format (possibly something like http://st.bens/10barnd1). This would facilitate easy access to a pupils portfolio of work. Similarly this model could be followed by creating short URLs for specific pieces of work which would negate the need to print a QR code and stick it in the book or introduce a camera into the process. I do see there is some worth in the suspense created by having an image rather than text but I don’t see where this might add value to T&L. There are obvious and excellent uses for this anonymity like Gideon’s reference to a treasure hunt which might scaffold a learning process but this would not be suited to regular events. I’m being a little devil here because I know you are a fan of the judicious use of ed tech but I am unsure of the educational value in QR codes, except of course they are cool. What do you think? Have I missed something? Thanks for the comment Dai, sorry it has taken me a while to reply. I will do so now while I am catching up with blogging and commenting. I have to agree that there is a certain novelty value to QR codes but I think that this could be an important factor in their development. Without the novelty factor would people (particularly teachers) bother to fully investigate their full potential? A QR code’s job is very similar to that of a short url however it offers a quicker input which my students have begun to enjoy. I have simply encouraged as many as possible to download a free app at this stage and then begun embedding QR codes into presentations and our VLE. I have put links to key resources or homework reminders within them and a few (3/4) students do get their phone out and scan them. Also, being out of school on Friday I simply left a short url and QR code for my Y13 class to access their cover work. I am sure most of them used the short url but some did scan the code. As I used Delivr I had a record that I could check while I was out of school. Where do I see this being useful in edcation is in the work done by David Mitchell and Julian Wood in connecting the non-ICT classroom with the Web via mobile devices. Mobile learning is only going to grow and I think that QR codes or (other) similar technology is going to play an important role in that. Perhaps as Leonard Low suggested in the comments above that QR codes may be an “intermediary technology” and that eventually phones will be smart enough to scan a short url and then immediately access that page; negating the need to generate a QR code. I’m sure that Google with their “goggles” technology are probably already working on making that part of the package. With that I see massive potential for sharing/accessing info with your students quickly in the classroom. For example, you may be discussing the social issues that were prevalent at the time Mary Shelley was writing Frankenstein. You could stick a short URL to a useful website about this on the board for your students to scan and read during the lesson. Giving them control over when and for how long they access it, like giving them a choice of worksheets, offers them ownership of their work, which can be a very powerful thing in fostering an active learning environment. In answer to whether you have missed something: I think not. You raise valid points but I believe that just like ‘social bookmarking’ or ‘using Twitter in the classroom’, QR codes are worth exploring; then it can be decided what their value might be. If they add nothing to the learning process I believe this will become clear and the buzz will die away. On the other hand if the evidence begins to show that their is value to be added to the learning of students through their use then the time spent experimenting will have been worth it. With QR Codes experimental usage initially may be found to be redundant. For example I have seen multiple references that suggest a teacher could provide a code that links to notes for a lecture. But if the teacher has a class website the students probably already bookmarked the site. However, I agree with James we have to experiment with it. Twitter was seen as frivolous exemplified by messages giving updates on what people were doing. Today a purposeful use in education is its evolution as a tool for professional development. I am particularly looking at ways to utilize QR Codes for special education and differentiated instruction. And I have found multiple uses. One example would be to put QR Codes in a text book at the point of section headers. The QR Code would go to a audio file to tell the student what to look for or key into in that particular section. The QR Code could also go to an introductory video on You Tube. Time/funding prevented further experiments but the idea was welcomed by the young people who were very independent in the production process. I would dearly love to get this going again and try a larger narrative based in location and time so the QR links take you to a dynamic URL that responds to things like time, weather, news or even trends the potential for creatives and education is mind bending and I am looking forward to my next experiments. Oh – well it looks like I have just written a project outline for myself – I shall be making this happen asap…. What a fantastic idea Adam, highly innovative. This has definitely got the synapses firing. This could really open up / challenge traditional notions of location based learning. Potentially a whole unit of learning could be built in this way; project based with a non-linear (or linear) path of discovery. I guess time and prep would be at a premium but never-the-less I think it’s worth exploring. I hope you get this going… and please share the outcomes. James, I am a fifth grade teacher in a gifted and talented classroom, and at the end of each year, we have a “GT Expo” in which the students must complete a project. The project must include some form of technology….and the problem of each student having a laptop to use in the presentation area is overwhelming! This year, I think I will encourage my students to add QR Codes into their research papers so that those who visit their project area can use their smartphones to visit sites the students have incorporated into their papers. Next Next post: #edjournal – Sneak Peek!